This smoothie is comprised of some of the best antioxidant foods that can be found, which makes it a powerful elixir for easing inflammation and strengthening your immune system. You need 1 cup cranberry juice, 1 cup frozen or fresh blueberries, 1 teaspoon matcha powder, 1 cup raw or cooked chilled beets and 5 large ice cubes. You can get a creamier texture by adding unsweetened coconut or almond milk. For every two cups of vegetables or fruit, you need to add one cup of liquid. Put in some ice cubes and then put all of them in a high-powered blender. Now you blend until they are completely smooth, pour it into a glass and enjoy to the fullest. This smoothie contains some great ingredients that offer you plenty of skin-healing antioxidants, vitamins and other essential nutrients. You need to get 3 large carrots, 2 oranges, 1 large cucumber, a pinch of cinnamon, half a can of coconut juice or water and half a banana. Wash the vegetables and fruits first. Then, you peel the oranges, bananas and carrots and cut them into small pieces. Combine them in the blender with cinnamon and coconut water. Now, you put them all in the blender and process it until it is of the desired consistency. It can be served immediately. Chew the smoothie like you are eating it instead of just drinking. Everyone needs to cleanse and detoxify their body to keep it healthy and to get rid of all the toxins. You can drink a detoxifying smoothie for this purpose, which will revitalize your body by replenishing the minerals and vitamins. You have to get 2 tablespoons lemon juice, 1 cup fresh and chopped pineapple, 1 cup coconut water, 1 teaspoon fresh peeled and grated ginger, 1 handful baby spinach or kale, 1-2 cups ice cubes and pinch cayenne pepper. Add the fresh lemon juice, coconut water, ginger, pineapple, spinach and cayenne pepper to the blender for making a delicious tropical smoothie. You blend all the ingredients together until it is smooth and then drink it for a clean and detoxified body. This breakfast smoothie can deliver a huge amount of nutritional benefits to you that will keep you energized throughout the day. However, this smoothie is not very sweet and if you want to add some, you can just include half a banana. The ingredients you need for making your breakfast smoothie are ½ cup frozen blueberries, 1 frozen banana, ½ cup frozen chopped kale, ¼ cup raw cashews that have been soaked for half an hour, ¼ cup carrot juice, 1 big baby spinach leaves ¼ cup unsweetened vanilla almond milk and juice from half a lemon. Now, you should add all the ingredients to the blender. Put in the solid firsts and then pour in the liquids. The lemon juice is optional and you can skip it if you like. You can now blend all these ingredients together for about 20 to 30 seconds, depending on the blender you are using or the consistency of the smoothie. Once you have the desired consistency, you can pour it in a glass and drink it up. It will provide you with the ideal vitamins and minerals you need in your breakfast. 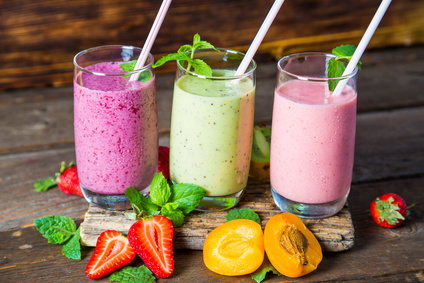 Make any of these smoothies for achieving optimal health in the long term as they will cleanse your body, provide you with necessary nutrients and give you a clear and healthy glow to your skin at the same time.